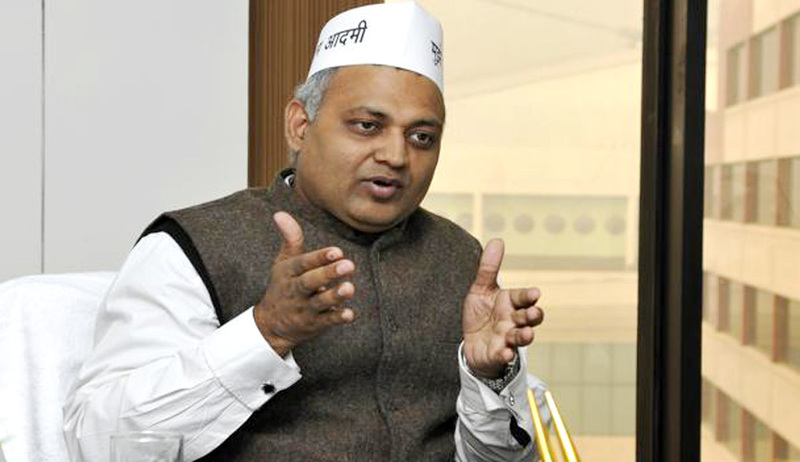 The Supreme Court today dismissed the anticipatory bail plea of former Delhi Law Minister and AAP MLA Somnath Bharti, booked for attempt to murder and matrimonial Cruelty on a complaint by his wife, and asked him to surrender immediately. Just after the court's oral order, Gopal Subramaniam, the senior lawyer who represented Bharti took instructions and told the bench headed by chief justice H L Dattu that his client shall surrender in the police station by 6:30 pm today. Bharti had approached the apex court after Delhi High Court rejected his anticipatory bail and he had promptly gone into hiding after that. At the outset, Subramaniam told the court that it was a matrimonial case and if the husband goes to jail, the chances of reconciliation are marred. The bench then asked “ how are we concerned with that issue at this stage ? You failed before trial court and also did not succeed in High Court . As a responsible citizen what should have been your conduct ? Go on the run ? or surrender ? “First surrender and then come before us next Thursday. We have a good mediation centre here..We will see what is to be done.First you surrender we will take it up. We will most happily deal with it..But you should not be running away..Surrender.. we will certainly look into everything we will be the first person to say --refer matter to the mediation centre if it is in the interest of children. We will also go through the files and also find out if she..the petitioner’s wife wants to sit in mediation", said justice Dattu. The High Court had earlier dismissed his anticipatory bail plea, saying the allegations against him were backed by "documentary proof". His wife Lipika Mitra had filed a complaint with Delhi Commission for Women on June 10 alleging that her husband had been abusing her since their marriage in 2010. She had also given a complaint to the police in this regard.